Another year, another Singapore Cocktail Festival! I still remember going on a boozy bar hopping tour a couple of years ago and having loads of fun. 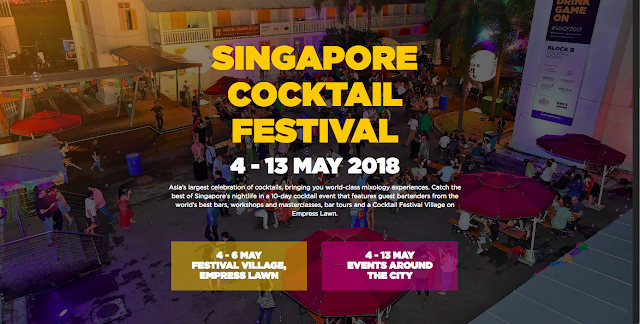 Anyway, this year the event will kick off with the Festival Village from this Friday 4th May to 6th May Sunday (S$12 nett cocktails! ), while participating bars will be offering special #SGCF2018 cocktails and food pairings at special discounted prices islandwide from 4th till 13th May (the next Sunday). What's more I'm doing a giveaway for two Festival Village tickets for Saturday so read on more to find out how to win! "features over 25 local bar pop-ups with their specially curated cocktails for the festival; 20 artisanal spirits brands from around the world; and over 12 internationally acclaimed guest bartenders. Other highlights include a variety of gourmet eateries available at the Food Street such as Ninja Cut, Ninja Bowl and Sinfonia Ristorante, live music from the Resident DJs of CÉ LA VI, and the adrenaline-pumping Asia Bar Battle." 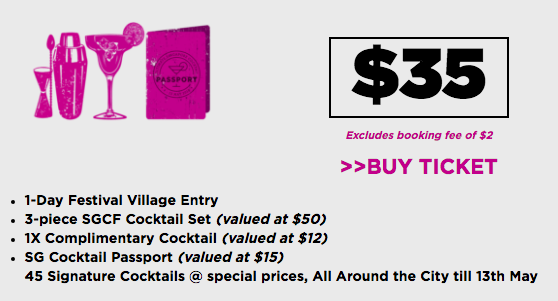 Hop over to www.singaporecocktailfestival.com to buy your Festival Passport! (I recommend the $35 one cos it has the best value). You get the cocktail set, a complimentary cocktail and the passport that allows you access to signature cocktails at special prices in other bars. I'm also doing a giveaway so check it out. You will win a pair of single-day entry passes worth over $150 to the Festival Village on Saturday, 5 May. Each ticket also has all the perks listed above. Thanks to Food News PR for the tickets giveaway! I really would like to visiting Fancy's booth. I'm always up for a good Gin cocktail and their's sounds really tasty! I am most excited to try Smoke & Mirrors.